I'm being told to run boilers at 160 deg, so the boilers will run longer to make domestic hot water. now the meat, 2) Aerco 2.0 propane boilers, and 4) 120 gallon Super stor, dual coil indirects. I noticed that the domestic circulator ran 24/7 and never really made 140 deg water in tanks. (aquastat setting). The Maintenance guy that has been here for several years, says i'm running the boilers too hot. Heating system is a combination of baseboard (old), fan coil units and some heat pumps, via a diverting valve to maintain loop temp. Now the problem, there is no control to turn down or to a reset temp. for heating. Is this something new, I understand condensing boilers. But it cant be more efficient to run boilers constantly and the circulator, and under a heavy load, running out of hot water. Is this something Aerco suggests? My experience is limited, but I think matching the indirect coil load and boiler output makes the most sense, whatever the flow rate and water temp is. SO long as return water temp to the boiler is above approx. 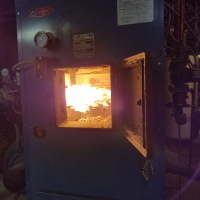 130F for a CI atmospheric boiler. But even then, you should occasionally inspect the heat exchanger for evidence of condensing of the flue gasses. Here’s an example, if you have a 2 stage gas valve, the Aquastat could be wired to only call low stage to increase run time or use a 2 stage controller to manage it, even better. For example, low stage on a 200k boiler would have an approx output of 115k on lo stage. A typical 40 gallon indirect coil would match that with the right flow rate and supply water temp. So the firing of both would match. so, youre saying it is more efficient (or better) to run boilers lower, say 160. Let the boilers and circulator run non stop. While this may be ok during a light domestic load, has trouble making enough hot water during a heavy load. Running boilers up to 180/190 during a call for domestic, heat the water in the tanks quickly (probably 10 or 15 minutes) and then shut boilers (and circulator) off/standby? and/or if a call for heat is present, back to a reset curve? If you want the tanks at 140 and you have a big DHW load 160 boiler water may not cut it. Don't know what you have for controls but I would use a Johnson Controls A350 with a sensor in the indirect then you need 1 S350 stage module and 1D350 display module. When the A350 calls you bring on the pumps and #1 boiler, if the temperature drops the S350 brings on second stage boiler #2. Then set the boiler limits at 190and let her rip. Second priority is radiant slab at grade: 80F to 130F +|- 5F depending on outside temperature. Lowest priority is oversized baseboard: 120F -150F +|- 7F depending on outside temperature. The only temperature mixing valve takes the nominal 140F water from the indirect and delivers it to the house. The aquastat in there maintains 140-160F water in the indirect. I tried using lower supply temperatures to the indirect, but it would run way to long. I did not like that in winter because while it was running, it was not heating the house. And I could not see the boiler running continually all summer long even with the firing rate down at 20%. As is, it seldom runs more than 10 minutes at a time. If I do not use any hot water, it runs two or three times a day. run the boilers up for domestic, then you can let it ramp back down to a reset temp for heat. Well is it more efficient ground out of hot water? I guess that would also conserve water and make guests mad! I'd say you need to run the boilers as high as needed to meet the DHW demand. Who knows what the coils in the indriects look like. Could be scaled up and have much reduced output. You can also try shocking the coils. Drain out the indirect, run the hottest water the boilers will produce through the coils, and dump the cold water on them (open cold valve back up). May break away some scale, them flush it all out through a full port ball valve drain. As always, the amount of heat transfer between the coil and the water in the tank is proportional to delta T. If you lower the boiler setpoint, you lower the rate at which heat is transfered (all other things being equal). In theory, the best and fastest heat transfer would be to have the water in the coil at 2500 degrees, but obviously we don't do that. 190 degrees is a good setpoint for domestic water heating becuase you still get at least a 50 degree delta T (assuming a tank setpoint of 140), but you are not at risk of making steam should the system pressure drop, and you are within the maximum temperature limits of the tank, piping, pumps etc. Think about trying to heat a tank of 125 degree water using 127 degree water in the coil. You will be very inefficient, because so little heat can actually flow out of the coil into the tank due to the low delta T.